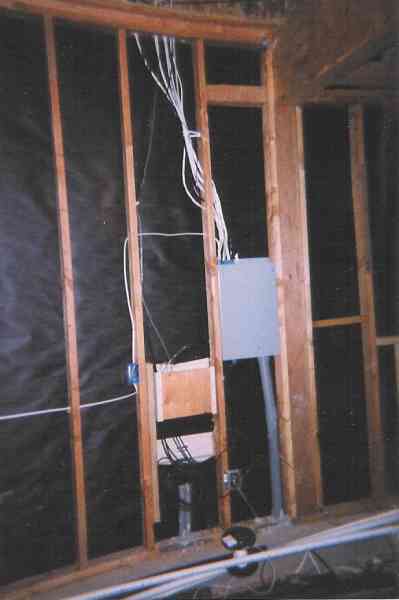 Register Log In ECN Forum Forums Photos for General Discussion Bad Wiring? .. What do you think? Here are some pictures I took last year when I was in San Diego. These are new homes less than 10 miles from Lego land in a development of 1500 homes. Top: 3 gang box is over crowded with wires. 3 wires being pinched by overdriven, uninsulated staple. Clamps in box bent down and totally useless. Less than 6 inches of free conductor on neutrals and no grounds pigtailed for switches. (maybe CA still uses 96 code?) AND THIS IS JUST ONE BOX!!! 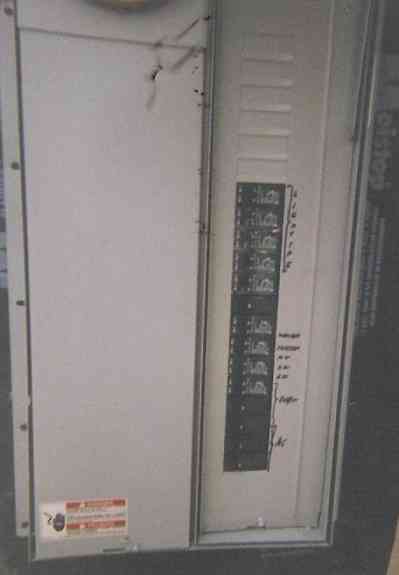 Next picture: This is a back view of an "all in one" panel common out west. Notice how all the cables are bundled tightly together above panel. Also, the RX right below the blue outlet box is bent too sharply and the staple is pinching the wire. Bottom Picture: Front view of all-in-one. Top 8 breakers labelled "Lighting." 3 breakers not labelled at all. Tandem 15 breaker mismarked as "Oven." I also found crooked/loose nail-on boxes, loose wirenuts, overdriven staples eveywhere, and any other violation you could imagine. The sad part is these all the wiring I saw was like this, with no regard for good wokmanship. 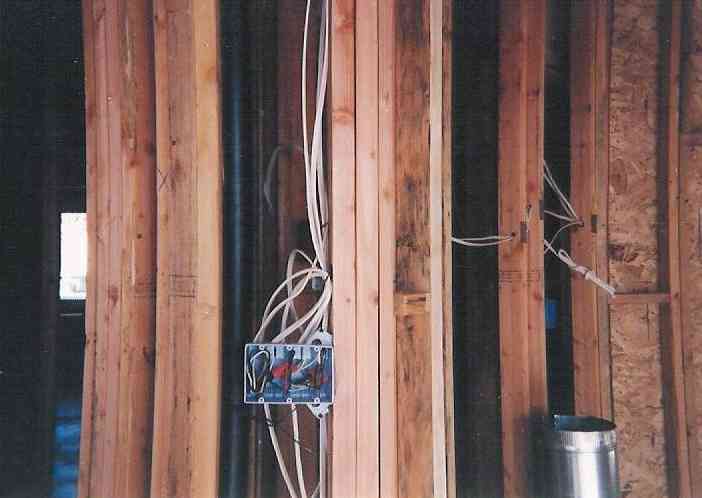 And these are just a few examples of what the wiring is like in these "luxury homes" that start at $550K!! Anyway, I know some of you might think I'm being really picky but I would get fired if I did work like this. I know the area. I worked on Lego Land. At the time there was a lot of those expensive homes going in and a lot of condos too. I looked into renting temporarily while I was working down there but prices were way out of my range. Just goes to show there is shoddy work everywhere regardless of how much you pay. I found that Carlsbad was real tough in plan check but not too tough when it came to field inspections. Yeah, the real estate prices are ridiculous in California. And like you said, just because you pay alot doesnt mean you get quality. The wiring wasnt the only thing that was questionable. The ductwork and plumbing was really bad too. I dont know enough about framing and carpentry to comment on that though. I read somewhere that CA doesnt require electricians to be licensed. Do you think licensing would prevent some of this mess? There are so many houses going up in that area that it doesnt seem like an inspector could possibly catch all the mistakes. I wonder if these even got inspected at all, like you said. The guys wiring those houses might have 2 years experience maybe $12 (Top Dog) per hour and no foreman. And on top of that some guy wondering why they didn't finish in 2 days. They usually got a real eye-opener when they went to work for someone who cared. Maybe that will change now that CA is finally working towards getting electricians licensed. Hopefully this will eliminate the Kmart electricians. "I have my pouch and tools now I am an electrician"
It amazes (and somewhat frightens) me that there could be an unlicensed electrician on this planet although I know that's the reality. It also amazes me that there are strict licensing requirements for beauticians/hair cutters and none for electricians in some states although a bad hair day for an elected or legislative official can be disastrous since there's no insurance against the imminent damage that looking anything less than polished could do to one's political image (said tongue in cheek) whereas there is insurance for replacing valuables when they're torched in an electrical fire. Well said! I am amazed as well that a state like CA with all its "progressive thinking" doesnt require electricians to be licensed!!! And from what I've heard, it will be years before the new licensing requirements go into effect. Yeah, that sounds about right. I remember going into a house with no wiring one day and when I came back the next day to snap some photos, the wiring was almost done!!! I guess with that pay, no supervision, and no license, this is what you get! I hope that licensing eliminates these "elecktrishins," too. I know it wont solve the problem, but it should make it better. I couldnt believe it when I opened that panel and saw all the 15 amp breakers labelled "lighting"! As a Californian, I am ashamed of wiring I see like this. I'm also ashamed of the State's requirements for electrishuns to perform work...NONE! Please understand that we don't condone this type of garbage. Lots of this type of work is done by the guys that jump the fence at San Ysidro, then work "under the table" for unethical Contractors that don't give a rat's *** about quality. Piece workers? Are those the guys that get paid based on how many outlets they can install in a day? BTW, I didnt mean to offend anyone on this site from California. I am sure that no one with any pride would ever do work like this. In case anyone is interested, these homes are built by national companies that have nice glossy brochures saying how their company is the "Quality Builder" or "Premier Luxury Homebuilder" etc.